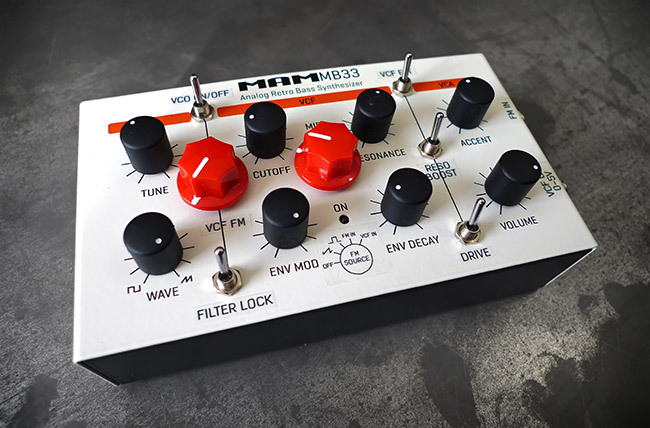 The MAM MB33 Retro is the latest version of the MB33 / FAT FREEBASS clone of the infamous Roland TB-303. 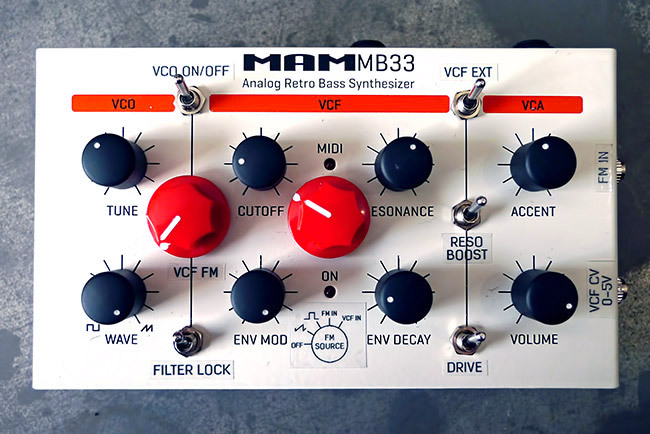 Previous versions have been rackmounted, but the new MB33 Retro comes in a small desktop case.Essentially its an analogue bass synthesiser that does a excellent job of sounding like a 303, only for a 20th of the price of the real thing! It certainly sounds a hell of a lot more convincing than the new Roland TB-03 or the lamentable TB-3. As standard it features all of the original TB-303 controls, and also has an external audio input through the filter and VCA. Overlapping midi notes gives you that essential 303 note slide, and any midi note with a velocity of 120 or more will trigger the note accent. Realistically if this synth was programmed correctly, you would be VERY hard pressed to distinguish between this unit and a real 303 in a mix. We have modded this machine with our circuitbenders Acid FM mods to give a huge range of extra sounds, hopefully without diluting the essential TB-303 character. VCO Drive: The MB33 retro seems to be designed to slightly distort the output stage at full volume, much like the TB303 did. 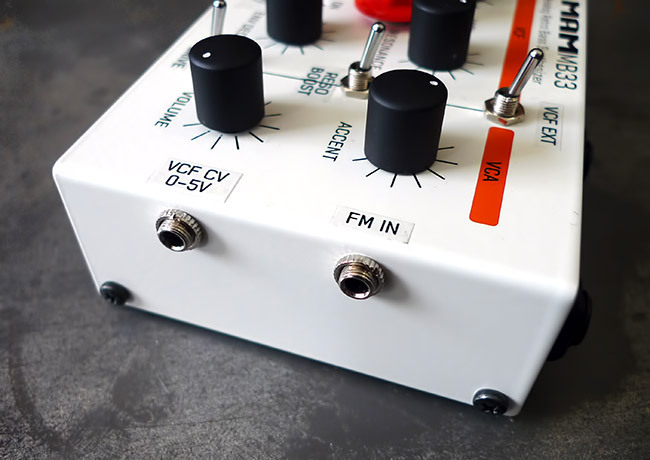 The Drive mod boosts this distortion savagely for some grungy acid techno sounds. This mod increases the maximum amount of distortion at maximum volume. The intensity of the distortion can be set using the normal volume knob. The FM controls allow you to select one of four sources for the FM signal. The first is the normal filter input socket round the back. This means you can run a sound through the filter section, but also use that sound to modulate the filter cutoff at audio frequencies at the same time. The second source is a new FM input jack on the right hand side of the case. Using this source allows you to run a sound through the filter from the VCF input or just use the internal VCO, and at the same time modulate the filter cutoff with an entirely independent sound source at the FM in jack. The actual audio from the FM in jack is not heard. The remaining two sources are the sawtooth and square wave signal from the main oscillator. These can be selected as sources completely independently of the setting on the VCO waveform knob The FM source select knob also has an 'off' setting. VCF CV input: One of the major drawbacks of these machines is the lack of any MIDI knob control. While we can't add straight MIDI control this mods adds 3.5mm jack on the right side of the machine that will accept an external CV to control the filter cutoff. The CV input should range from 0-5v. Higher voltages, or negative voltages are NOT recommended. This mod also adds a switch on the front to toggle between internal and external cutoff control. Filter Lock: Another annoying feature of these units is that if you want to use the VCF input to filter external audio signals you have to trigger the filter and VCA envelope using a midi note message, the filter then closes until it receives another midi trigger. This also means that by default the external signal will have the VCA and VCF envelope applied to it, so regardless of what kind of sound the external signal actually is, it will have a TB303 filter and amp envelope. While this can be useful on some occasions, a lot of the time its just annoying so what this mod does is add a switch that locks the filter and VCA open at a constant level without having to use any midi input. The filter can then be adjusted in realtime using the cutoff and resonance knobs. Obviously if the VCO is turned on, you will hear a constant tone as soon as you activate the filter lock. You can turn the VCO off using the VCO on/off switch, but you should try playing some notes with the VCO and filter lock on, as it can generate some interesting organic sequences, especially when using the accent feature. PLEASE NOTE: These units are modded to order. We normally have a couple of unmodded units in stock, but its normally a week or so until we can have one modded for you and ready to ship. If you want to buy this synth get in contact HERE.